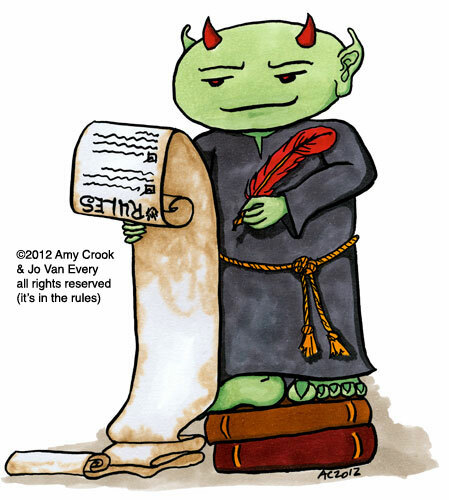 I’m afraid this Tuesday is tentacle-free, which is probably against one of the many rules on this Gremlin’s parchment. He’s another commission for Jo VanEvery to use in her work — she’s promised to post about him and yesterday’s cartoon soon, so keep an eye out! I found the first sketch for this in my photos recently (I take iPhone photos to show a client their sketches rather than scanning them, to save a bit of time), and I was amused to remember that he’d originally been tall and skinny. We both liked his scroll so much that I kept the overall height, and instead added some books to stand on and made him wide and squat instead. Rules Gremlin, 5″x7″ pen & ink and Copic marker on paper, nfs (commission), all rights reserved.